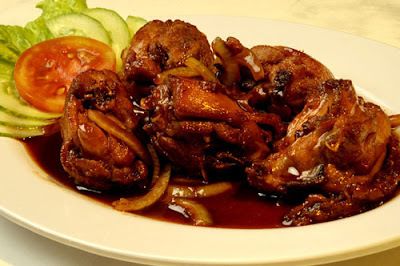 Ayam Cincane Recipe is one of the culinary mainstays in the Samarinda city. Typically, this culinary is used as the main course when people of Samarinda conducting a wedding or event welcomed the guest. While a culinary tour to the city of Samarinda, “ayam cincae” menu can be found in some shops or restaurants. Chicken meat is served with reddish spice into the distinctive characteristics of “ayam cincane”. It is very tasty and delicious, because the seasoning spices and coconut milk which are pervasive in chicken meat. The aroma of roasted chicken meat increasingly arouses our appetite. The chicken is served with fitting sauce and white rice warm. Let's see how to manufacture and the ingredients which are needed to make this dish. This dish is one of the typical traditional cuisines in East Kalimantan. In the manufacturing process of “ayam cincane”, you need to use chicken meat as the basic materials, because chicken is known to have a more savory meat. Then after the seasoning fragrant, you can put the chicken and cook until it changes color. Add salt, coconut milk, brown sugar and lime juice. Cook until the coconut milk dries and then remove from heat. Finally, you need to grill the chicken until fragrant while occasionally smeared with leftover chicken seasoning. Thus is the recipe of how to make tasty “ayam cincane”. Hopefully this recipe can be beneficial to us all. In the presentation, “ayam cincane” can be served with warm rice. As a complement to this dish menu, you can also add the tomato sauce, while to adding strength to the sauce flavor you can add lemon juice. That’s our article about “Ayam Cincane” Recipe.